Dog Allergies: Do Dogs Get Spring Allergies? Yes! Do Dogs Get Spring Allergies? Yes! Allergens that cause spring allergies in many of us--trees, grasses, weeds, dust mites, molds and insects--can cause skin infections, itching, sneezing and other reactions in our canine friends as well. Constant paw licking, body rubbing and excessive scratching are all signs your dog may have an allergy. Hair loss, odor, rashes, a "flaky" or "greasy" feeling coat are other symptoms. Itching can also be caused by contagious mites, fungal infections, autoimmune skin diseases or hormonal abnormalities, so it's important for your vet to distinguish the source. Symptoms of airborne allergies are most often observed when dogs are between six months and four years old, but tend to become more severe with age. Dogs often show symptoms at the same time every year, usually when the seasons change. Treatment can begin once an allergy is diagnosed. Simply washing the offending allergens off of your dog is often a great first line of defense. Washing your dog's paws after spending time outdoors or frequent bathing of the entire body may also provide temporary relief. Oral supplements and medications may also provide relief, although something like fatty acid supplementation may take months to be effective. Over-the-counter antihistamines for humans provide relief in some cases, but never give these to your dog without asking your veterinarian first, as many also contain other ingredients that can be deadly for dogs, such as pseudo-ephedrine, ibuprofen or acetaminophen. Allergy vaccines, oral or topical steroids or oral cyclosporine can treat very severe seasonal allergies. Careful observations and a trip to your veterinarian are the first steps in helping your dog survive allergy season. Enjoy your springtime outdoors! Dr. Heather Peikes is Manhattan's only board-certified Veterinary Dermatologist. 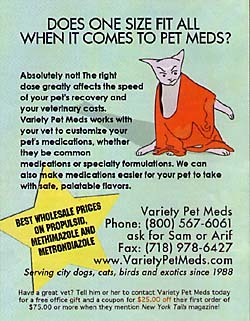 She practices at Animal Allergy and Dermatology, located at 32 West 25th Street; 212-206-0969; www.animalallergyanderm.com. Click here for other articles about dogs on the New York Tails Web site.